Oumuamua - Is This The Evidence That Aliens Have Found Us? Have you heard of Oumuamua? No, it's not a bizarre ingredient, remote location or a strange message we've received from space. Well, not exactly. Oumuamua is an object detected travelling through the solar system in October 2017 by Robert Weryk, a Canadian astronomer, using the Pan-STARRS telescope from an observatory in Hawaii. It is relatively small, thought to be between 100m-1000m x 35m-167m. When first detected it was already heading away from the sun and about 21 million miles away from the Earth. It is a dark red colour. It is moving so fast relative to the sun, that this rules it out as having its origin from within the solar system. This prompted its naming, which is the Hawaiian word for 'scout' or 'messenger'. So it is definitely interstellar in origin, but what is it? 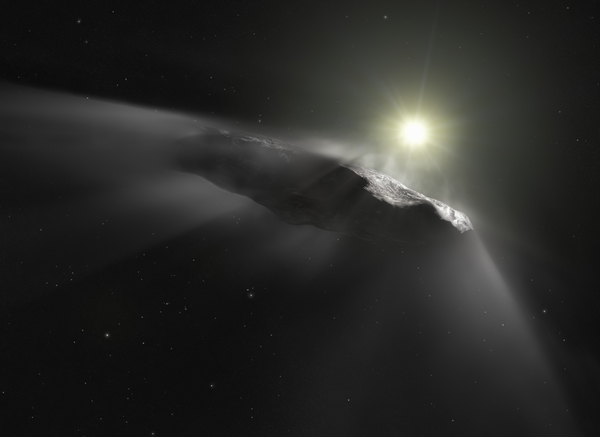 A year after it was discovered, a Harvard based astronomer, Avi Loeb, published a paper that focussed on the unusual acceleration seen by Oumuamua. They stated that it was possible Oumuamua was a "fully operational probe sent intentionally to the Earth's vicinity by an alien civilisation." Avi Loeb was interviewed in the New Yorker magazine this week where he reveals some more details on his theory. Loeb believes we should consider Oumuamua as being of alien origin, not just because of this one specific case, but because it will help the scientific community take these events more seriously, and to pay more attention if something like this happens again. His reasons for thinking this might be an alien probe include the fact that statistically, something travelling this fast through our solar system shouldn't be happening, it's highly unlikely it should be here in the first place. Loeb also points out that when discovered, astronomers calculated that Oumuamua spins every eight hours, and that its brightness varies by a factor of ten as it spins, meaning it is at least ten times longer than it is round. Most have interpreted this to mean Oumuamua is cigar shaped. But, it's also possible that it is pancake shaped. One might almost say, saucer shaped. Oumuamua is also seen to be in an orbit that deviates from what is expected if that orbit was controlled purely by the gravitational force of the sun, so something else is acting upon it to shape its orbit. Traditionally, with comets, that can be things like evaporated gas from ice on the surface of the comet giving it a push. This gas is what you traditionally see as a comet's tail. In this case, no tail has been observed. It's not behaving like a comet or an asteroid. It is unusually shaped. It shows a huge change in brightness as it rotates. Loeb believes perhaps that change in brightness could be caused by the light from the sun bouncing off the surface of the object, providing a push. But for that to have an effect, the object would need to be less than a millimetre thick, so, a solar sail perhaps? Loeb is quite clear on his belief that it is entirely possible that technologically advanced aliens could well exist somewhere in our galaxy. Why? His first reason is very close to home - because we exist in the first place, why we should we be unique and special? Second reason - the numbers. With a quarter of the star in the Milky Way having at least one planet around them with potential Earth-like conditions, that gives you tens of billions of opportunities for life to have developed elsewhere. Despite all that, the majority of scientists would still classify this object as a comet, and don't believe it's been sent to spy on us! Natural or alien-made, where did it come from? Comets are space debris left over after planetary systems are created. So it is possible that Oumuamua was ejected from its home star's solar system at a time when the planets there were being formed. Astronomers had to trace its trajectory back to find out where this object could have originated from, and stars which might have crossed paths with this object. A team of scientists at the Max Planck Institute for Astronomy in Heidelberg, Germany did just that and identified four possible candidates. All four stars are classified as dwarf stars - meaning their masses are similar to our smaller than that of our very own sun. However, none of them are known to have planets in orbit around them, which could possibly knock the alien hypothesis on the head. But the software the scientists used is still in early stages of its development, and forthcoming versions of the software will allow them to examine many more stars which might highlight new candidates for the origin of Oumuamua. What with the news about recently detected fast radio bursts we reported on recently, why are we seeing more evidence for there being potential intelligent alien life attempting to detect or communicate with us? 100 years ago, we wouldn't have detected these radio signals, or observed these objects, purely because we lacked the technical skill to do so. As our technology develops, we'll no doubt pick up more potential signals from possible aliens. But this doesn't conclusively prove these are of intelligent alien origin. Remember how science advances. Scientists, the good ones, should never claim they have definitive answers to anything. You make observations, you take some readings, you try to come up with a hypothesis which explains what you've seen. You publish your results. Others can they try to prove or disprove your findings, and scientific knowledge, bit by bit, creeps forward. So this is just one possible explanation for Oumuamua. There are plenty more, and most of them don't rely on intelligent alien life.